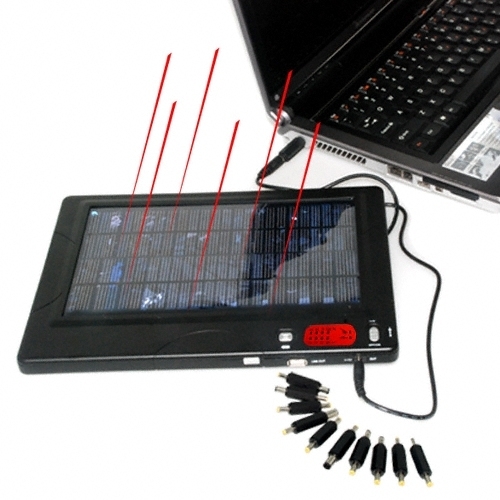 Chinavasion has this new “High Capacity Solar Charger Battery for PC Laptop + Mobile Phone” for sale which looks quite promising in terms of it’s 20.000 mA/h accu – enough to feed your laptop’s battery. Recharging the internal battery of cells (yeah! :-) is said to take around 3h @ AC and 8-10h through the use of the solar panel. What irritates me a bit is that on their website they are talking about a monocrystalline solar panel type, although it obviously is a polycrystalline type? Anyhow, an interesting alternative for ~ 96,- EUR. Let’s see when this will hit the European market (soon?). I am still dreaming about a foldable solar panel that I can put on the cover of my 15,4″ HP nx8220 laptop and that will recharge a 2nd battery pack in an unused space, e.g. the media bay that currently hosts the DVD burner. Unless someone comes up with a much better (slimmer) rechargeable battery system, I am currently more interested in devices that generate power instead of just storing it (mechanical, solar, …. devices vs. NiMH/LiOn/…battery storage systems). That makes two happy people…. Sijui ninunue na ASUS EEE PC then go blog from Samburu Land for a christmas stunt? Seriously.